Normal baby positions will lead to comfortable natural labor. However, it seems that many factors can change the positions of the babies. Therefore, some labors are a little uncomfortable and harder for moms. For instance, there are always possibilities for moms to go through asynclitism or asynclitic birth. What is asynclitic presentation and position? Asynclitic birth is an oblique presentation of the fetal head in labor. The head of the baby is presenting first (a cephalic presentation). The head tilts sideways so that a parietal bone enters the pelvic brim. Given strong uterine contractions and molding of the fetal head, the head may pass through the brim. The asynclitic presentation is totally different from a shoulder presentation. In shoulder presentation, the baby’s shoulder presents first. The asynclitic is the basically ordinary condition in a labor. Many babies will enter the pelvis (plural pelves or pelvises) in that condition. The asynclitic presentation will be corrected once the babies are in going through a normal birth. The process will push the babies and correct the head position. Vaginal delivery is then possible. However, the persistence position of asynclitic can cause dystocia. In most cases, dystocia will lead to a Caesarean section (C-sections) procedure. But, moms do not have to worry about it. They need to only consult it with a professional and experienced midwife. A skilled obstetrician will also be able to help moms to achieve natural labor. The specialists will help moms to move the baby to the correct position. Most of the time, moms feel impatience with this type of labor. The experienced midwife or obstetrician will take their time to allow movement of the baby in such a way that it can enter the pelvis safely. In addition, the medical team will wait for the molding of the skull for a larger passage. Asynclitism is simply an asymmetrical position of baby’s head. As the head tips towards one shoulder, the time passing through the pelvis will be longer. 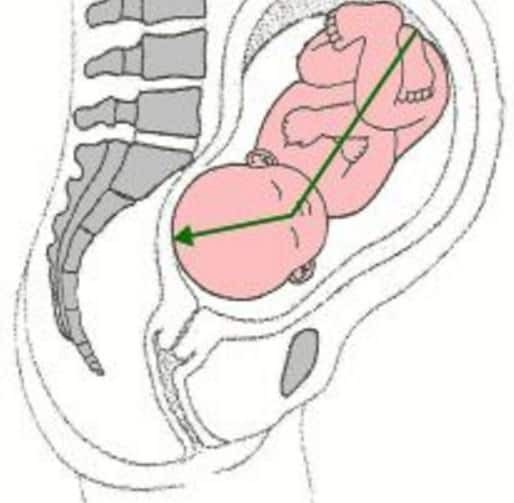 Therefore, the first impact of the asynclitic baby position is an extended duration of labor. Can you palpate and feel a baby is asynclitic? Based on the experience of a professional midwife, it is hard to feel the baby and check the position because of the deep location in the pelvis. A thorough check is needed for checking the exact position of the baby. What can cause a baby to be asynclitic? There are no clear explanations for the causes of the asynclitic baby. However, some cases show that the pelvis shape causes that position. Babies love to adapt the shape of the womb. When it is time for the babies to born, they search the most comfortable position in the pelvis. Human pelvis is not always symmetrical. That makes the baby asynclitic position occurs. When it happens, moms do not have to worry. Anxiety will possibly make labor uncomfortable. The duration of labor is different from one woman to another. Therefore, it is important to enjoy the moment comfortably. Moms should never feel impatience because the process might be more tiring and painful as they feel stressed. Moms need to let their midwife do the job. To fix asynclitic (baby’s position) moms can try some of these things: belly dance movements, exercise, yoga, meditation, squats, walking, knee chest, and swim. Normally, the asynclitic position will not cause significant difficulty. It will only make the labor duration longer. Besides, it is necessary that moms search for information related to the topic previously. That will help them to understand their condition. The asynclitic baby position is not a dangerous condition to be frightened of. It is helpful to also check out this video and join a forum for sharing the experience and stories of pregnancy. Asynclitic will be one topic that occurs in many labors.